There is a bit of madness that is a part of planning. No matter what you do, you can’t avoid it. For other type A folks like myself, your inner instinct is telling you to rebel against this notion, but you know I am telling the truth. Applying to grad school felt like a big race. Race to what? I have no idea, but a race nonetheless. It felt like I was running three lives actually, one in the present, one for the future, and one just because I’m human and well life is a race (excuse me, I mean a marathon) let’s be real. Having to balance school – which I did not take my loved ones advice when it came to taking it easy- balance planning for the future and having 10 different plans, while trying to balance the avalanche of emotions that would come in waves about leaving a place that has become my home and the fountain of a huge portion of my own personal growth. I set out with the intent to apply to 8 schools and 4 fellowships. What actually happened was three fellowships, and 3 schools. I was contacted for two interviews, for a fellowship, and one for a graduate program. Went to both, loved both, and then had to go back to doing one of the things I’m honestly pretty bad at doing – WAITING. LAWD when I say that on God’s perfect plan for Stephanie year 2015 agenda, “teach her how to wait and if she does’t learn keep making her wait some more” had to be in the top three because I feel like I’ve spent 85% of my Aug 2014- April 2015 waiting. Finally word came back, and 1 fellowship and 3 schools. 1 – come to another interview, and 3 yes. Then I had to WAIT some more. It came down to this week, 1 fellowship, 2 schools. On top of learning how to wait. I’ve learned how to really think and process through what I claim to be my dream. I’ve sorted through it a hundred thousand bajillion times. I’ve had all sorts of plans in my head for each possible way it could work out, but what I didn’t notice before was that I chose to assign the backdrop of my dream to be New York City, when at the core my dream didn’t need a city to become a reality. My decision for my next steps boiled down to two schools. Once I heard from the fellowship (another no sadly) there was no way I could put of the decision any further. And so there was a point in time where I felt frantic. I prayed. I stressed. I dreamed. I googled. I didn’t everything, I made a dozen pro and con lists, and all of it pointed me the same thought “follow what feels right”. Claiming this decision as my own. I’ve tried so hard to not include my loved ones in this decision. And as bad as that sounds, there is a very particular reason why I did that. It’s because, my loved ones are already at my core. I will take them no matter where I go. I tried to keep their words out of my mind because I knew that if I let them all the way in, that they would control my decision completely, rather than the realistic portion. The question then was, should I stay in NC and not be in debt, or should I follow my lifelong dreams of going to NYC and be in a good deal of debt, good enough to make a growing public servant get pretty nervous about the actual possibilities of paying them off. So the school I chose, I chose not because my family wanted me to. Not because my boyfriend wanted me to. Not because of the money (completely). But because throughout this race of a process, and all the craziness, there was one school that made me feel the best. There was one school that allowed me the opportunity to vouch for myself, to think about my decision, but most importantly, cooperated with me as I relearned my dream. You see dreams are constructed. We rest in the little tiny details, without stopping to remind ourselves what the main goal is. So I began to think, is my goal to be in New York City, or is it to further develop as a leader? Is my goal to be around bustling buildings and live the city life again, or is it to use my leadership skills and experience to help make a difference in the word. And finally, did I want to be in New York city… or have I been saying it for so long that I was afraid to let go and consider anything or anywhere else? I chose to let go. Momentarily of course – I’m stubborn I know- but I chose to let go and pursue the real goal. The real reason I want to go to graduate school in the first place. And so I’m very excited, for a number of things. 2) I feel great about the school that I decided on going to. 3) This program felt right from the moment I stepped onto the campus. 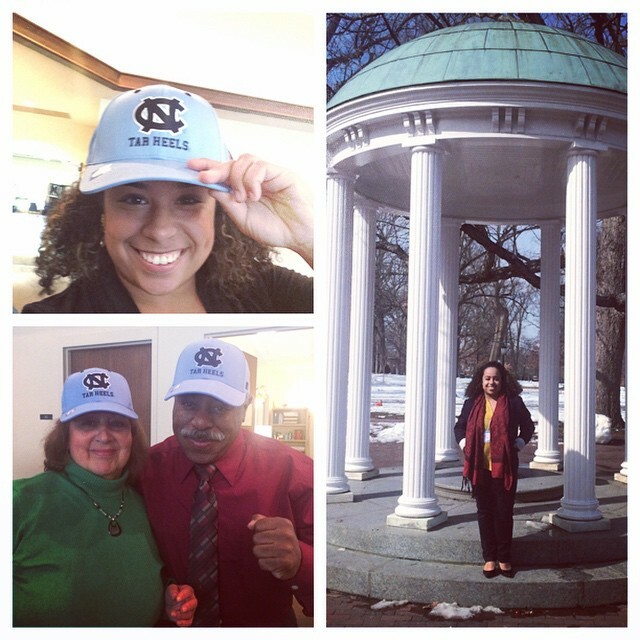 4) I get to join the ranks of one of the world’s largest networks – the UNC Chapel Hill Family. I am over the moon excited, slightly terrified, and hella (totally appropriate word) determined about my next step; beginning this August 2015, I will pursue a Masters of Public Administration in the School of Government at UNC Chapel Hill. But what if I fall? Oh darling, but what if you fly ? : Choosing not to crumble. Stephanie I am so proud of you and proud to say I know you. You are going to do big and wonderful things. Continue to follow your dreams, however that looks, and following the plan God has for you and your life. I wish you many blessings and adventures on this journey. Keisha !! Thank you so much for all your support! Love you so much, I’m so glad and proud to say I know YOU, you are a wonderful person don’t ever forget it ! This is wonderful! If you need any support from the mountains I will also be at UNC for a masters degree, always feel free to reach out!